Successfully Added Audio Recording Photo Album and Scrapbook - 10 Minutes Total Recording Time, 20 Pages, Photo Corners (Red) to your Shopping Cart. 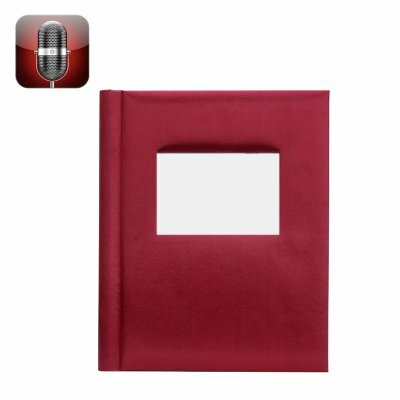 This voice recording photo album and scrapbook lets you store the sounds as well as sights of your most precious moments. You can store away your baby’s first steps with any photo album but this one will let you record their first words as well! With 20 pages to fill you’ll have room for loads of life’s miraculous moments, but it may be hard to recall everything from your past even with a picture. That's why this audio recording album can store the sounds as well as sights. Flick through pages and gaze upon your photos and to help you rediscover those memories and the event surround them you can play the audio recordings and transport yourself to the past. It could be the first music from that very first dance at your wedding, a special message from a loved one, some words of wisdom from your parents or grandparents. Whatever the sound, this audio scrapbook and photo album can record it, and with a total of 10 minutes recording time it will allow you to add notes to funny photos and inject your pictures with recordings for future viewings. Made of high quality fabric and textured paper it will take pride of place on the book shelf and when completed this book will offer bundles of entertainment to you and your family for years to come. Great for family reunions, parties, a wedding or even baby shower it makes a great gift and will keep on giving years of joy and entertainment time and time again. The Audio Recording Photo Album and Scrapbook comes with 12 months warranty. Brought to you by the leader in electronic devices as well as wholesale audio gadgets, Chinavasion..